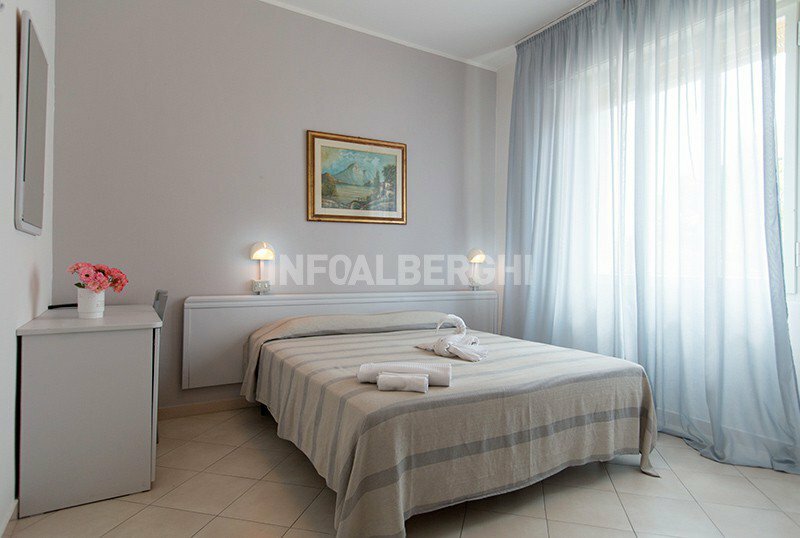 The Hotel Ancora B & B in Villamarina di Cesenatico is a new 2 star hotel that offers a relaxing and comfortable stay thanks to the many services made available to the staff, including air conditioning, equipped internet point, goodnight buffet and unlimited hot and cold drinks. until late morning. Pets allowed. The Hotel is located in a side street of the main avenue, which divides Villamarina di Cesenatico from Gatteo, just a few minutes walk from the sea. The whole area becomes pedestrian in the evening and is enriched with shows and music. The rooms all have a balcony, free air conditioning, satellite TV and digital terrestrial, private bathroom with shower curtain. A hairdryer is available on request. Some rooms have a balcony. FAMILY: communicating and family rooms up to 6 beds are available. At guests' disposal: garden with gazebo, tables and chairs, rental bicycles, air-conditioned rooms, hall with TV room, centralized safe at reception, internet point with PC, printer and connection, board games, drinks dispensers, snacks and buffet of good morning and goodnight. PARKING: free and available until exhaustion. CONVENTIONS: beach, amusement parks, discos, gym, swimming pool, spa, waterslide, law enforcement. BREAKFAST: a good morning and goodnight buffet is set up every day. Also available to guests is a hot drinks and cold drinks dispenser and snacks. In hotel: pediatrician and baby sitter for a fee.